Are you looking for a way to brighten up your yard? While there are many different outdoor lighting options available, string lights can add a beautiful glow to your patio. There are so many different string lights to choose from. From commercial outdoor string lights to fairy string lights, the options are endless. So get ready to brighten up your home with this guide on how to choose the best outdoor string lights, as well as the top ten best outdoor string lights on the market. 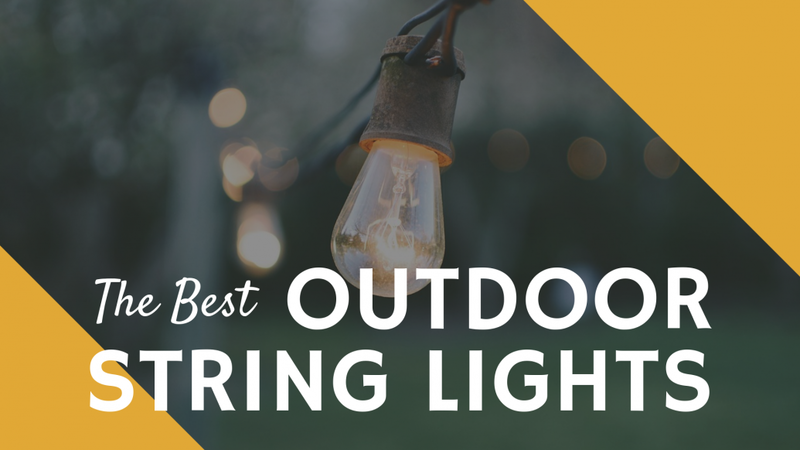 In the chart below, you will find our top 10 rated outdoor string light options. For a more in-depth review of each model, please click on "Read Review." There are many different types of string lights on the market. Whether you're shopping for outdoor Christmas string lights or outdoor string lights that will light up your patio this summer, there are plenty of options for you. Here are the different types of outdoor string lights. Also called commercial grade string lights, this type of string light looks similar to a regular light bulb, but it of course is on a string. It is called globe string lights because of its round shape. 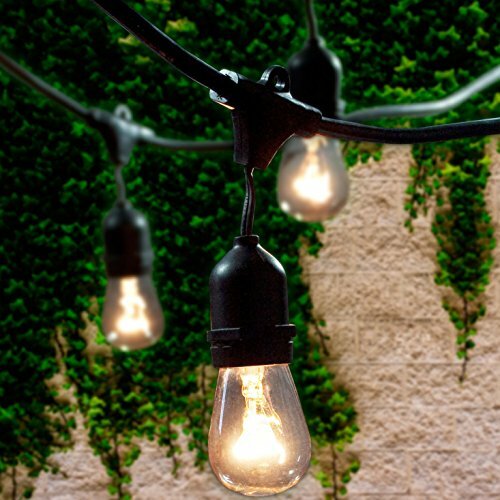 This type of string light is very popular, especially for patios and yards. It is different looking from Christmas lights, and therefore would look great anytime of the year. You may have seen fairy string lights used to decorate Christmas trees. Because it is favored by many, there is an outdoor version of this light that can be used for patios and yards. It is different from traditional string lights because each light bulb (which is about 1 1/8 inches tall) is spaced out on the wire. Besides looking great strung out, it also looks great when placed inside a jar. The jars can be great outdoor table centerpieces, or can be placed on the ground to light up walkways. Rope string lights are very unique, and look great at outdoor or barn weddings. The wire looks like a rope, which is why it is called "rope string lights", and the lights are very small. In fact, you can barely see the bulbs. It looks like the rope itself is the light. For those who want to be a little more unique, outdoor novelty lights are for you. Novelty lights come in many different shapes and sizes, including dragonflies, roses, ladybugs, frogs, and mushrooms. You can also get outdoor lights that hang down off the ceiling so that they look like a chandelier. LED string lights can come in any shape and size. In fact, many globe string lights and outdoor novelty lights are LED lights. Why should you choose LED lights? Well, LED patio string lights are energy efficient, give more light, and are more durable. Do you need string lights that don't need plugged in to an outlet? Consider trying solar string lights. Solar string lights use the sunlight to charge themselves, and will bright up the night just like any other string lights. Outdoor party string lights come in different colors. They are most common for outdoor parties, hence the name. It is common for outdoor party string lights to have colors such as blue, red, yellow, and green. Another type of outdoor string lights is the battery powered string lights. Because it is operated by batteries, it is more portable than other types. Hence the name, curtain string lights hang down like a curtain. They look very similar to fairy string lights and rope string lights because the light bulbs are small and they twinkle. Curtain string lights are great for hanging at the edge of your patio roof, but you could hang them somewhere else too. If you had a pergola, this type of string lights would be a great option. This type of string lights is unique looking and great for parties. It is in the shape of a large ball, and there is a covering that covers the bulb. This creates a soft glow so that it is not too bright for guests. There are so many advantages and reasons for buying outdoor string lights. Not only do they bright up your yard, but they can also be used for parties and weddings. If you are wondering if outdoor string lights are worth buying, here is a list of some reasons why indeed they are a great investment. It Makes Your Yard Bright And Beautiful At Night: Obviously, the number one reason why string lights are great is because they add beauty to your yard. A bright home can bring beauty and attention. Great For Outdoor Parties: The next time you have an outdoor barbecue you can string out the outdoor string lights. Outdoor string lights are also common for weddings. Rope string lights and fairy lights look the best for outdoor and barn weddings with their romantic glow. Outdoor String Lights Are Waterproof and Made For Outdoor Weather: Unlike the string lights that you put on your indoor Christmas tree, outdoor string lights are made for the outdoor weather. They will not become ruined by rain nor snow. That is why many people also use them to decorate outdoor pine trees for Christmas. Outdoor String Lights Are Perfect For Decorating Your Home For Christmas: Speaking of Christmas, outdoor string lights aren't only for summer parties and weddings. They are also great for decorating for Christmas. Because they are waterproof, you won't have to worry about the snow damaging them. They Help You See Where You're Going At Night: Even if you have a porch light, outdoor string lights are perfect for guiding your way as you walk outside at night. Before purchasing string lights, it is important that you consider a few considerations so that you buy the right product. To help make your decision easier, I've created a list of considerations that you can ask yourself. What Length Do I Need the String Lights to Be? The best way to know the length you’ll need is to use twine (pretending it is the string lights) and stretching it from point to point exactly where your lights would go. Don't forget to include enough to reach the outlet. If you will be wrapping the string lights around a tree, measure once around the tree and multiply that by how many times you’ll string the lights around. Once you determine the total length, divide that by the length of a single strand for the quantity you’ll need to purchase. What Size Bulbs Do I Need? Smaller bulbs provide a gentler, more decorative background twinkle, while larger ones can provide a larger amount of light. If you are wanting a light that will be bright and give you plenty of light, consider going with a larger bulb size. If you only need it for decoration, small bulbs will work fine. What Am I Using These String Lights For? Are you using them for an outdoor wedding? Rope string lights work the best. Are you using it to decorate your porch? Globe lights are good because they are noticeable. If you host parties, outdoor party lights are nice because they are colorful. And if you want to be creative, novelty lights are what you're looking for. Are String Lights What I'm Looking For? Decide if you are actually needing string lights. If you need to light up your driveway, a garage light may work better. If you need to light up a walkway, solar lights that stick into the ground may be what you're looking for. Consider if string lights are what you need. Now it is time to take a look at the different features that outdoor string lights have. While it may seem like string lights do not have many features, there are actually a lot of useful and interesting features that make string lights a great option for your backyard. Let's take a look at some of them. Outdoor string lights are easy to install. When you hang your string lights, be sure to hang the strings first, and then go back and install the bulbs. This gives you some additional protection against breakage, as the bulbs tend to break when they are getting installed. Before you take down the string lights, remove the light bulbs first. While each light bulb is different, most string lights are very bright. They make your yard appear bright and cheery. Like I mentioned earlier in this article, outdoor string lights are great for parties of all different kinds. 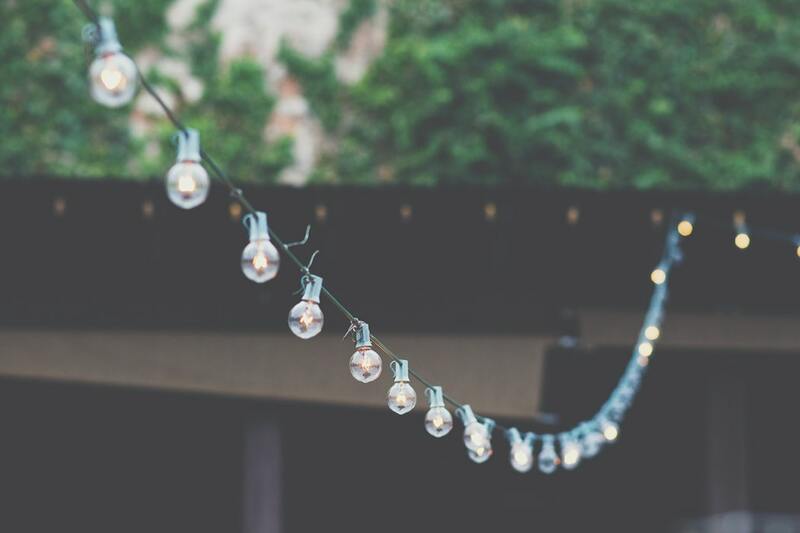 From weddings to backyard barbecues, string lights can brighten up your yard and make it appear more welcoming. If one type of string lights doesn't fit your needs, you will surely find one that does. With 10 different types that I went over, and maybe even more, you will most likely find one type that will fit your needs. Some types are more for parties, such as the outdoor party string lights, while others are great for weddings, such as rope string lights. And if you can't make up your mind of which type you want, you can mix and match them. There are so many different ways to decorate with string lights. You could hang them on your roof, around windows, wrap it around trees, hang it on sheds and garages, put it around wreaths, place them in mason jars, or hang them around hedges. In addition to this, you can hang them around gardens and walkways. 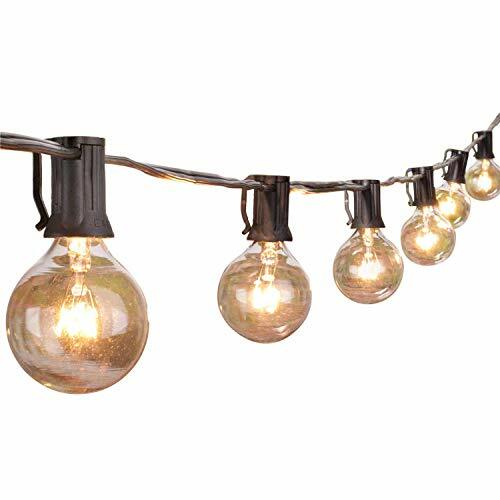 Our top pick for the best outdoor string lights is the Brightech Ambience Pro Waterproof Outdoor String Lights. It has Edison bulbs, which are similar to globe bulbs but they are more in the shape of a tear or strawberry than they are as a ball. This outdoor string lights is rather expensive compared to other string lights, but according to customers it is worth the expensive price. It has a soft glow, and it has a dimmer so you can soften the brightness if needed. The Brightech Ambience Pro Waterproof Outdoor String Lights mostly got positive feedback. Outdoor string lights can add so much brightness to your home. Whether you get party string lights to decorate for a backyard barbecue or curtain string lights to hang down your roof, you will find that string lights bring a soft glow to your home. Of course, before buying you will want to go over a few considerations. I gave you a small list of considerations to ask yourself, including what length of string lights you need, what size bulbs you need, if you need string lights, and which type you are looking for. Each type has its own special features, but some common features include that they are bright, easy to install, there are many types to choose from, and there are many ways to decorate with string lights. Have fun shopping for outdoor string lights, and hopefully you'll find one that will fit your needs and give you the patio of your dreams.